Have you ever felt old or possibly heavier than you actually were? And maybe self-conscious about the appearance of a double chin? Even resorting to the tried and true techniques of making an under the chin bulge less apparent? You know… Standing up straight! Holding your head up high! Sucking up and tightening the area under the chin! In the past, many patients have opted for plastic surgery procedures such as liposuction, face or neck lifts to help re-sculpt their problem areas under the chin. Now, Sunset Cosmetic Surgery has Kybella. A new, award-winning* injectable treatment, approved by the FDA, that is intended to slim down under the chin fat deposits (aka a double chin) without surgery. We’re excited to be one of the first cosmetic practices in the Los Angeles area to offer this revolutionary treatment. The fat-reducing injections are given in a series and by the end of the third – sometimes fourth – session, our patients typically begin to see exciting results. Their fat under the chin begins to recede. Achieved through minimally invasive treatments, that are performed right here in our office, Kybella has become attractive to both women and men alike. Prior to treatment, each patient is assessed to ensure there is sufficient cause. Though many patients see results in three to four treatments, up to six treatments may be necessary. Injection appointments last approximately 30 minutes each and are scheduled at least one month apart. But many can appreciate the quick recovery period and permanent effects associated with treatment. Kybella is owned by Allergan, the same makers of Botox and Juvederm, and has been approved by the FDA since April of 2015. The special compilation is injected through tiny needles and works best on patients without a great deal of extra fat or sagging, loose skin. The most commonly reported side effects are bruising, pain and swelling, but most often clear up within 48 to 72 hours. When choosing Kybella, or any injectable procedure, it is very important to select well-trained doctors and understand potential risks involved. The physicians of Sunset Cosmetic Surgery are both double-board certified in general and plastic surgery, and are often recognized as leaders in their field. Dr. Steven Svehlak and Dr. Daniel Yamini are both the recipients of multiple Top Doctor awards, as well as many patient and peer recognitions. First, and foremost, their philosophy in serving patients is always comfort, safety and satisfaction. Live with your chin up, increase confidence and stop worrying about long-time insecurities! 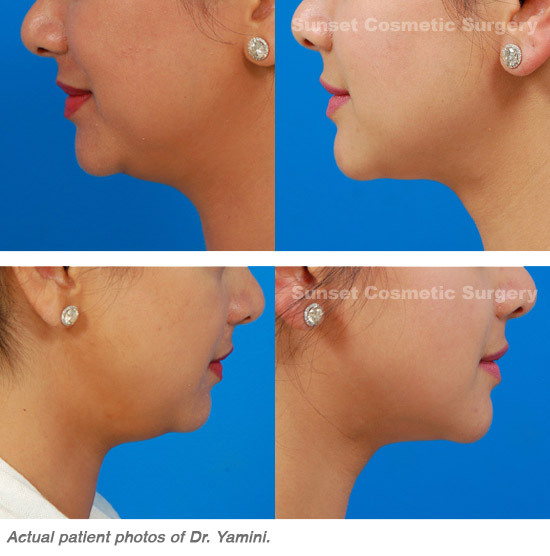 Book a consultation with either Dr. Svehlak or Dr. Yamini and learn more about Kybella – the non-surgical treatment for a double-chin. Visit www.SunsetCosmeticSurgery.com, or book a consultation by contacting us at (310) 858-9100. * Kybella injection won Allure Magazine’s prestigious “Best of Beauty” award. View press release here.